I am married to Paul Gordon, we have two children, our son xxxx who is three years old and our who is two. I planned our holiday last year and from a series of recommendations from family members, I looked at Mark Warner resorts. 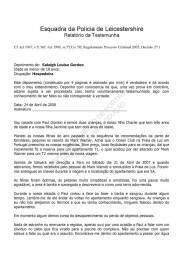 I found that the Ocean Club in Praia da Luz met with our requirements. Good price, good facilities for the children, I initially made a reservation for apartment T1 which was changed by Mark Warner to apartment T2 before we travelled. We left Gatwick for Faro on Saturday 21st April 2007 and when we landed we were received by Mark Warner staff and driven to Praia da Luz. We were handed the keys during the journey and given the location of the apartment which was 5A. The holiday was perfect, the people were kind and friendly. It was a very pleasant break, the area was pretty and relaxing and I would describe it as a sleepy place. During our stay Paul cut his face whilst shaving and the cut bled for some time. Neither the children nor I injured ourselves and as far as I know nobody died in the apartment. We never noticed that any of our personal objects disappeared or were lost. Nothing strange or worrying to note, just on one occasion I heard Paul speaking to an individual on the patio that looked over the complex's swimming pool. I can't say who he was talking to or what they were talking about. I was inside the apartment washing some of the childrens clothes in the kitchen that faced out onto the road. I did not see anyone pass in front of the window or knock on the door. I remember Paul entering the apartment and asking where the money was, I asked him why and he said something about a collection for charity. I did not go out to see or speak with the man. It was only after the disappearance of Madeleine and when the news broke that we thought we should contact the police, not because we thought there was anything suspicious about this but simply because we thought the police should be informed. I would like to add that this was the only time that we saw someone asking for money. The doors, windows and shutters of the apartment were all in good condition. We noticed that it was only possible to close the patio door from the inside of the apartment, not from the outside. The bedroom shutters made a lot of noise and I find it difficult to understand that opening them would go un-noticed. The bedroom overlooked the parking area and was also overlooked by other apartments from which I think that if anyone had opened the shutters from outside, somebody would have noticed. The front door was easy to open from the inside unless it had been locked. We always used the wooden door overlooking the parking area to enter and exit the apartment. With regard to the sofas, there were two on the right where you entered and another opposite the dining table - there was also a coffee table between the sofas. The sofa on the right when you entered by the patio door was situated against the wall and it does not seem possible to me that anyone could have passed behind the sofa. The children slept in the bedroom overlooking the parking area and Paul and I slept in the bedroom with the patio overlooking the pool. We would have breakfast in the Millenium restaurant, lunch in the apartment so that the children could have a siesta. We also dined in the Millenium except for two occasions when we dined at the Tapas Bar. I had the impression that dining at the Tapas was restricted to once during ones stay, and because of this it surprised me to hear that the McCann group used to dine there every day. The children would use the club facilities, I think they were called 'Ama 1 and 2'. They would spend the morning or afternoon, I dont remember them having spent a whole day there. We were always with them when they were not in the childrens club. It was usual to go to the Tapas bar at lunchtime and I know that of 6 occasions they went five times. On one occasion we thought of using the night club and we took the children there with their pyjamas on. When we got there we saw that the club was not for us and we did not leave the children there. We always took the children with us when we went for dinner. We never left them alone. I remember that at the welcome ceremony we were informed about the 'babysitter' services at 15 Euros per hour, but they told us that that the service would have to be booked well in advance. I remember that when we went for dinner there were couple without children and imagined that these services were often requested, but we never used them. I cannot speak badly of our holiday and this only changed after the disappearance of Madeleine. 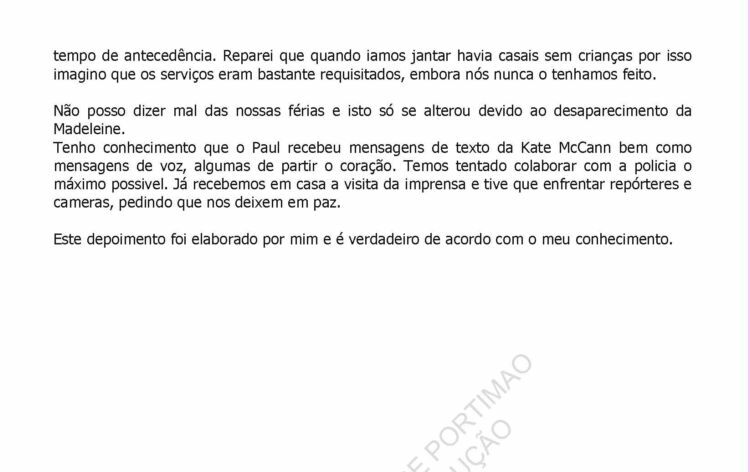 I know that Paul received text messages from Kate McCann as well as voice messages, some of them were heartbreaking. We have tried to collaborate with the police as much as possible. 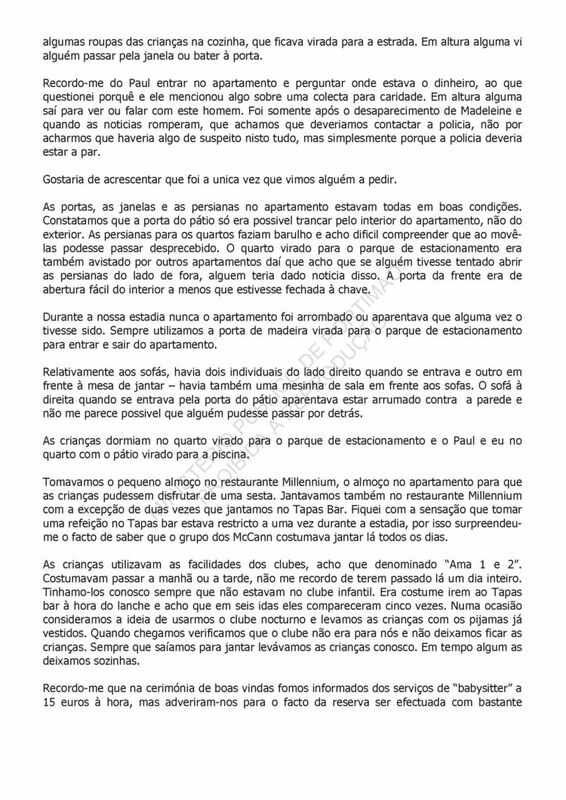 We have been visited by the press at home and have had to face cameras and reporters, asking them to leave us alone.